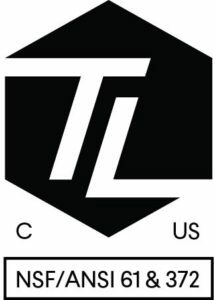 Truesdail Laboratories Inc. (now part of ALS Global) has certified the generators. Applications related to municipal potable water and health care water treatment (hot and cold water systems in hospitals and aged care facilities) require NSF/ANSI 61 & 372 certification for chemical generators. Dioxide Pacific has obtained this certification to ensure the above-mentioned generators can be installed and operated in these applications. What is NSF/ANSI 61 & 372? The aim of NSF/ANSI 61 is to ensure that the generator does not add any undesired health related compounds to the water via the chemical it generates. NSF/ANSI 372 ensures that no lead is added to the generated ClO2 solution. Many States in the US require NSF/ANSI 61 & 372 certification for chlorine dioxide generators. Even if it is not peremptory, this certification is reciprocal in other countries as recognition of high chemical generation purity and therefore lowest risk for potable water and water for use as an ingredient in food products or for washing. The Electricide® electrochemical chlorine dioxide generators produce 2,000 ppm chlorine dioxide solution which can be dosed and controlled to 3 dosing points. The generator PLC/HMI automatically measures ClO2 residual and controls dosing of ClO2 solution to ensure accurate disinfection. Generators are equipped with secure remote access capability to view, operate and receive email alarm notification. The Dioxide Pacific Electricide® CDE, CDEB, HG and HGB Chlorine Dioxide and Chlorine Generators are now CE Marked. 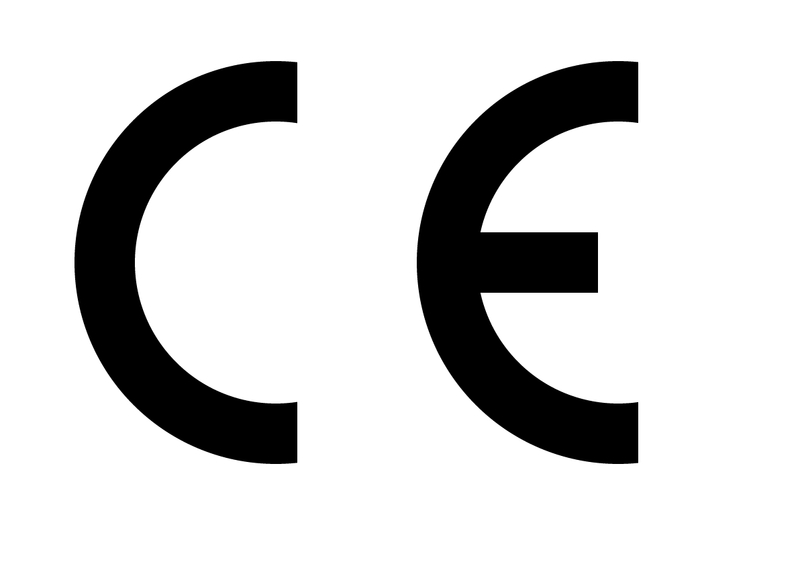 This marking ensures their suitability for sale and operation in Europe. We are looking forward to expanding our customer and distributor base throughout Europe for many and varied applications related to water disinfection and treatment. 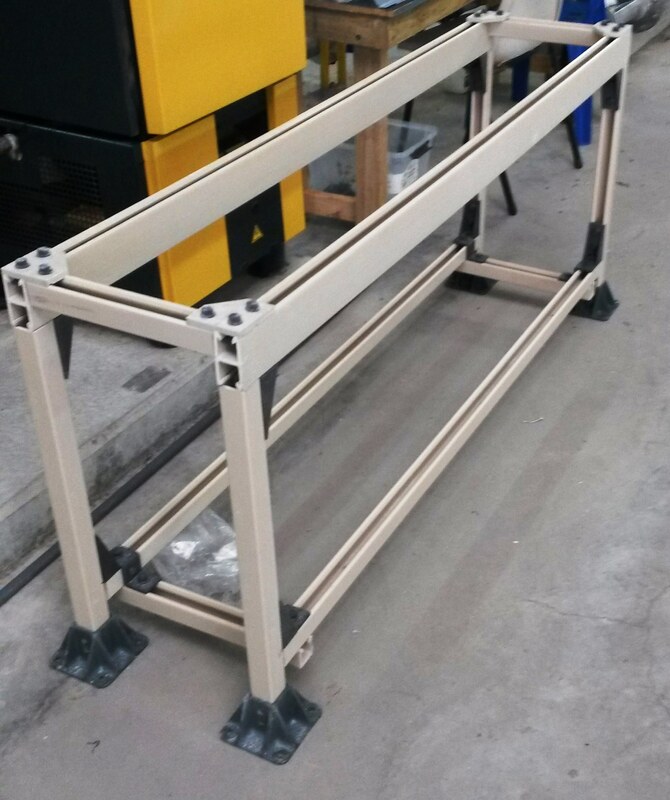 Fiberstrut vinylester channel, fasteners and brackets are ideal for construction of chemical dosing skid frames where 100% chemical resistance is desired. For chemicals like sodium hypochlorite, hydrochloric acid, sulphuric acid, fluorosilicic acid (FSA) ferric chloride and chlorine gas, dosing skids have traditionally been constructed from gal steel or stainless steel and subsequently epoxy painted. Of course, the painted steel looks good for the first few weeks. Eventually, the base metal corrodes either from a chemical spill or from chemical fumes. The result is an ugly plant room, costly removal of equipment and replacement of channel and fixings some months down the track. One of our customers recently provided chemical dosing skids for a water authority to replace existing skids that had corroded and failed. 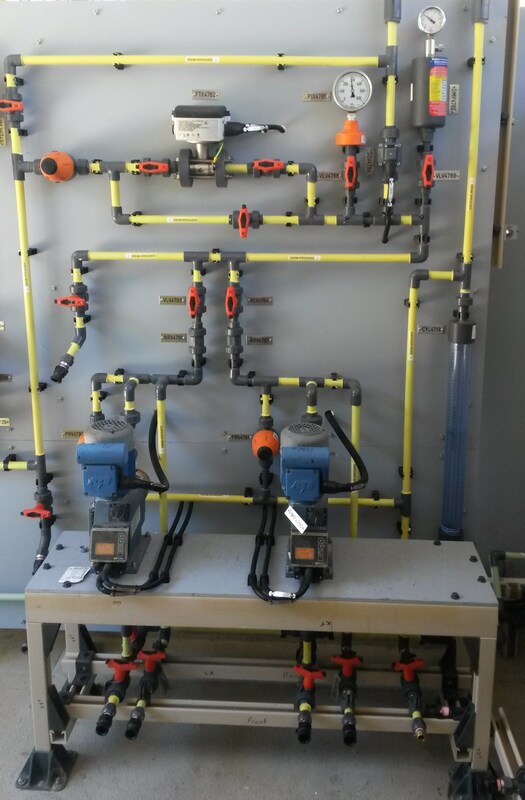 They chose to use Fiberstrut channel to mount dosing boards to the wall and for fabrication of pump stands. The stands were assembled from cut pieces of Fiberstrut vinylester channel, angle brackets, bolts, nuts and post bases. One key feature is chemical resistance. 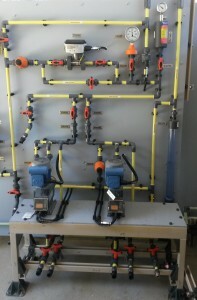 The dosing pumps will require maintenance and when disconnected, some chemical may drip onto the pump stands. If this happens, the chemical can be washed off and no corrosion will occur. Dioxide Pacific stocks a comprehensive range of Fiberstrut channel and components. Please download the Catalog. 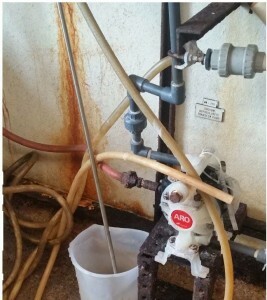 It may be worth considering the use of Fiberstrut for your next chemical dosing installation. Please contact us and we will send you a price list. Dioxide Pacific has supplied Electricide electrochemical chlorine dioxide systems for CIP sanitization in food and beverage applications with great results. In many cases, chlorine dioxide has replaced peracetic acid mixes. 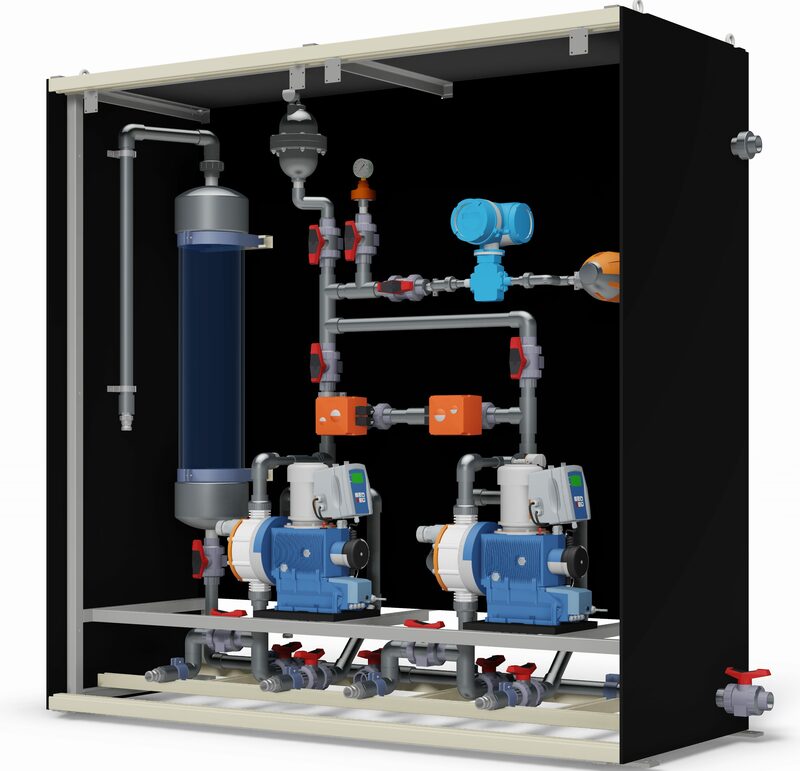 Typically, chlorine dioxide is applied at 1-3 ppm and can be dosed into the sanitisation rinse (flow paced) or made up as a 1-3 ppm solution (PID controlled) and pumped to through the system. Peracetic acid is typically used at 50-100 ppm. 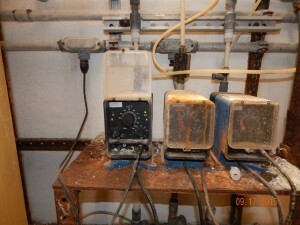 One such food ingredient producer has been using the Electricide CDE10 generator for 3 years. 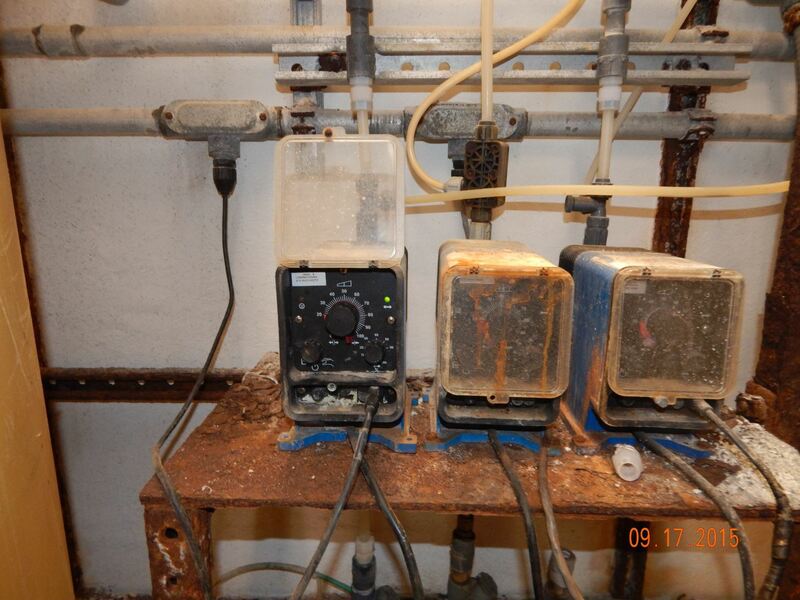 They were using peracetic acid dosed from a tote (IBC) using a metering pump and paying $80k per year for chemicals. During connection of a tote, an operator came into contact with the chemical. Peracetic acid has a pungent vinegar smell which aggravates eyes and burns the skin (peroxide ingredient). Management decided to look around for an alternative and decided chlorine dioxide should be trialed. After 3 months of successful operation, the system was purchased and installed. Current yearly running costs are around $10k and the capital purchase was paid back in less than 1 year. 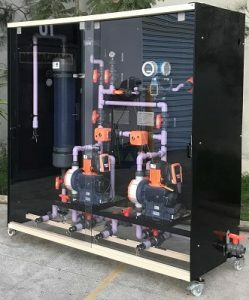 The customer is happy with the improved safety aspects of chlorine dioxide as Electricide-P1 (the chlorine dioxide precursor) has no vapor and is easy to connect to the Electricide generator. Chlorine dioxide solution at 2,000 ppm is pumped to a CIP make-up tank where 3 ppm solution is made-up and controlled. The 2,000 ppm solution is safe to pump through UPVC pipe and the 3 ppm solution has no corrosion issues in stainless steel tanks and pipework. One benefit of the Electricide electrochemically generated chlorine dioxide is the purity of the solution produced – no chloride and close to neutral pH. Other methods of chlorine dioxide generation produce chlorine dioxide with low pH and high chloride which increase the risk of stainless steel corrosion. Chlorine dioxide can be used as a final rinse as it will not react to form any odor or taint producing by-products in food and beverage products. This aspect will save a lot of water and energy. Usually, peracetic acid requires a lot of water as a post-rinse to remove the chemical. Chlorine dioxide does not require this post-rinse. If you have a CIP sanitization application and would like to do the numbers on chlorine dioxide, contact Dioxide Pacific. Take a look at the features of the Electricide generator.